We don’t have to look far in social media or our inboxes for news of the devastating effects of plastic pollution. We can no longer ignore it. That plastic NEVER disappears… all it will do is break down into tiny microbeads that will eventually find their way into our food chain. That plastic is not even healthy in it’s first use - never mind its second or third and when it gets into our waste system. Storing food in plastic, drinking water from plastic, heating food in plastic will all mean that molecules of plastic will seep into our food and drink and therefore potentially damaging. So we need to re-design our lives with less plastic and give a strong message to our food producers that we do not need plastic around the cucumbers, grapes in plastic boxes and everything covered in cling film! 1) Get yourself a water gourd and a reusable coffee cup (if you buy your coffee to takeaway!) - make it a point not to buy a bottle of water in a plastic bottle or a coffee with a plastic lid. Even in a cafe if they will not serve me water from a glass bottle (or even better from the tap), I will not buy their water. 2) Choose to store your food in glass or metal containers. I use jars from my beans and chickpeas or store soup in a bottle that was once passata. Re-use as much as possible before you re-cycle. 3) Find shops where you can buy foods and put them in paper or cloth bags or your own containers. They are popping up more and more. If you do not have access to this kind of shop then ask to see your supermarket manager and say that you are a customer that wants to see change - if no one is asking, no one is acting! There are so many great inspirational ideas out their on how you can reduce your plastic use. 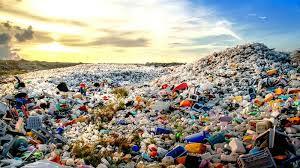 If you have done something that has reduced your plastic use - please share your ideas in the comments below. In the meantime on the there - a zero waste Spiced Cauliflower recipe!